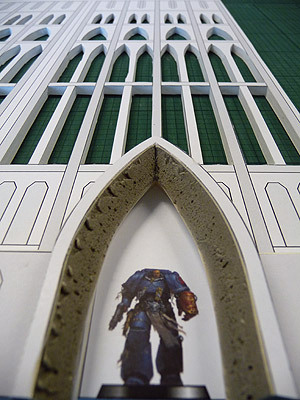 Confessions of a 40k addict: Terrain is everything - 40k Cathedral Tower. This is gorgeous, and dramatic too. It doesn't look easy to make, but the end result is clean and it has plenty of detail. It works very well as a lone tower. How much does it cost to make a building like this? 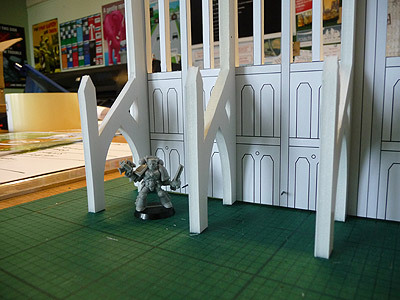 Warhammer39999, we had a lot of foamcard at work so I got it for free. It's just the time to do the template, which I realise now I haven't included, I'll rectify that as soon as I can and the time to cut and model it. 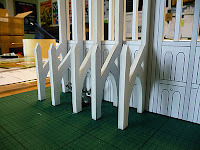 The two corner pieces I think actually fit on an A3 sheet the buttresses the same. ebay has 5 sheets of A3 at £8.50 [inc p&p] so that's £3.40. Not including hardboard for the base and paints etc. What you have to weigh up with terrain is the time to do it and whether you'd be rather painting your figures. It's far more craft based than artistic based but you can be arty with it. Mostly it's the time invested but when they're complete you do tend to get a lot of 'bang for your buck'. 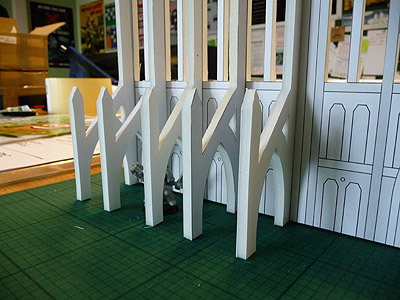 I've some more buildings and ruins to come, as soon as I finalise the templates. My time? Pshaw, that's why I have you! 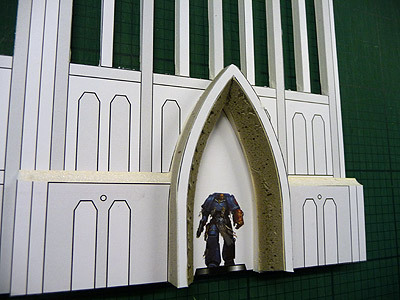 Ever consider making terrain for $$$? Well you consider it and then you dismiss it. 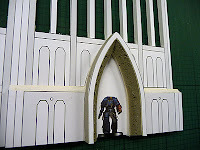 The GW kits are more detailed, more durable and probably cheaper. Time is a valuable commodity. I'll spend hours to entertain myself but once you start asking for Dollar$ it makes you realise where those last 5 hours went. Then you've got to box them up and ship them which makes them even less cost effective in the end. Giving away the templates seems to be more helpful to the community. Very nice, I know the undertaking a project like this can be. It's all in the details. This thing should look amazing once complete. 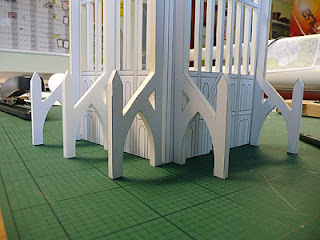 Thanks Ron, support like that is making me want to start looking at this structure again. Although instead of finishing this corner I'm thinking of doing the other side so I can make the complete tower! Way to go to double the workload! 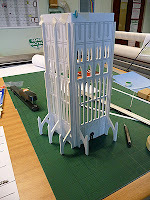 Please can you upload the template as i would love to try building it. can you also tell me how you created your templates? 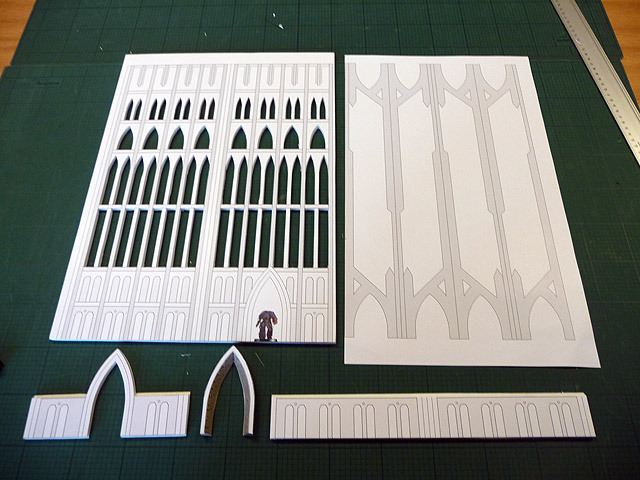 Because I like to ensure the templates are all correct and easy to follow the Cathedral isn't complete yet. I could upload it in it's current state but I wouldn't be happy about releasing it in a less than finished state. It's on my 'to do' list so it will be done.